This is a really delicious apple tea. I like that it has a strong apple flavor, but also a pleasant note of cinnamon that nicely accents the apple without overpowering it. 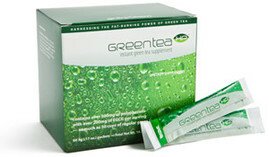 The green tea base is a smooth, rich tasting tea. The long spears of green tea (that sort of resemble blades of cut grass!) make me think that this is probably a Sencha tea, and the sweet, faint vegetative flavor of the tea further confirm this for me. 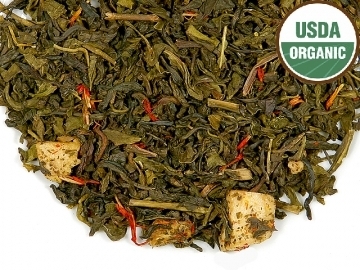 The green tea flavor is not particularly strong in this blend, but it is at an agreeable level that is neither too weak nor is it overpowering or too grassy. It’s quite nice. Both the apple and cinnamon flavors are strong here, but they don’t seem to be competing with one another. It is a pleasant synergy between the two distinct flavors. The cinnamon does have a nice warmth to it, and while I wouldn’t consider it spicy or hot, it certainly isn’t one of those soft, sweet cinnamon tastes either. It makes for a very nice autumnal tasting tea. I found this to be incredibly warming on this cold evening. As apple flavored green teas are among my favorites to serve as iced tea, I suspect this one would make a very good iced tea too. It doesn’t need additional sweetener, but, a small drizzle of agave nectar or honey is quite nice in this. This is my first experience with a tea from Souvia, and I am very pleased with it! This Turkish version of green tea, though delicate, features cured apple pieces and safflowers into a delicious tea blend. Our organic growers are able to customize the curing of their harvests and add a wide variety of flavors to their stronger blends. For tea lovers, blends such as Turkish Green Apple Organic Tea is full of great tea taste from the first sip to the very last. 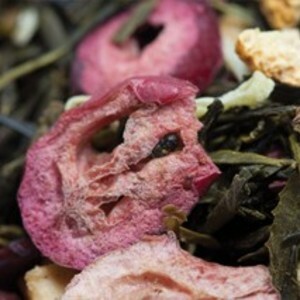 Back when I was actively blending and flavoring teas, I came up with a Green Apple blend that I was really loved. It is one of the blends that I miss most now that I am not blending any more. So it is very nice to be able to try other green apple blends. This one from Red Leaf Tea is very tasty! The green tea base is smooth and delicious. No astringency or bitterness, just a fresh, clean taste that supports the apple flavor very well. There is also an almost creamy note to it – buttery sweet! The apple flavor is sweet with hints of tart. Even though this is called “green apple” I am not finding it to be like a tart green apple, it is more like a sweeter red apple, although it is not overly sweet. Crisp, juicy and delicious! This is a delightful apple tea. As a hot tea, it is very comforting on a chilly evening, but it is also quite good when iced! Very refreshing! This is such a FUN tea! Elf Help Green Tea has VERY colorful ingredients and is highly scented! I can taste the green tea, sure, but there is a fruit salad type quality to it that I just can’t shake! I’m SO THANKFUL there isn’t Hibiscus in this! Thanks for that, DavidsTea! 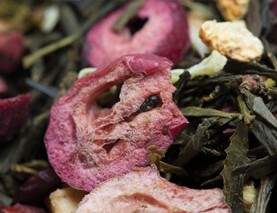 Sencha green tea, orange peel, apple, papaya, raisins, barberries, freeze-dried cranberries, coconut! The more I drink this the more I enjoy it! It’s fruity without being TOO fruity on the tongue! This is a GREAT offering from DavidsTea! I have this one listed in my mid to upper 90 percentile on my personal rating scale! 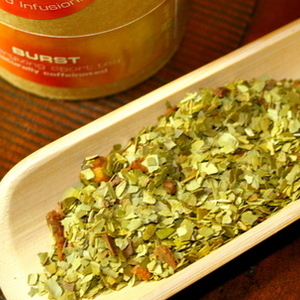 BURST is an Energizing Sports Tea from Teaqualibrium that I recently enjoyed! It smells and tastes like orange citrus but when I saw that it didn’t have orange or citrus in it I was a little surprised, actually. Perhaps it was word association or because of the label or something that made me think citrus…not sure! BUT shortly after I started sipping this I did pick up on the apple and cinnamon, too! Not overly-so on the cinnamon but it is tasty regardless! This is nice hot or cold.